Pigs were flying in Nairn yesterday, alongside lizards and the odd stingray. Giant kites, many of an animal theme, featured among other weird and wonderful inflatable kites floating over Nairn Links yesterday and in the next few months. The arrival yesterday of an array of airborne attractions marked an unofficial start to what is widely hoped to be a bumper tourist season for the seaside resort. 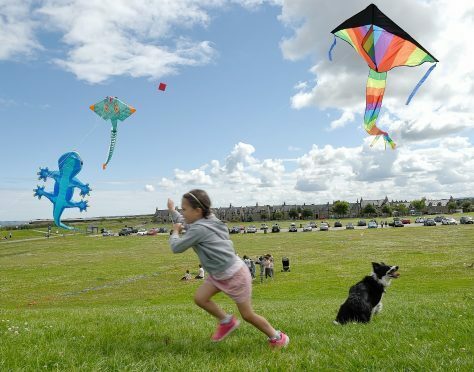 The popular kites will return on July 27 and August 24, assisted by a small grant from the Association of Nairn Businesses. Entrepreneur Andrew Beattie travels from south of Glasgow to fly the spectacular kites which have also taken him as far as Kuwait and China. His menagerie has expanded somewhat since his last Highland visit in 2015 with the addition of a new cat, crocodile, turtle and flying pig. Nairnshire committee chairman Michael Green said: “Things are on the up in Nairn. Last year’s inaugural Spirit Festival, which raises money for local charities, brought in more than £3,000. The organisers are confident of smashing that figure this summer as the event is extended to a week-long extravaganza. The programme will boast a wide range of activities and entertainment ranging from a lingerie show and country and western night to a charity golf dinner and a five-mile riverside ramble between Nairn and Cawdor which has prompted a community-led clean-up of the attractive riverside path between the two places. The Spirit Festival and Fringe has been expanded this year from four to seven days and will run from September 19-25. One of the headline events will be a comedy tour of various venues on the Saturday. “We’re putting on core events and whatever else others are putting on in Nairn we’ll be happy to publicise it,” councillor Green said.